The excitement of a new baby can quickly turn to worry when you’re facing a premature birth. Fortunately, we live in a time where modern medicine means even the earliest of preemies have a chance of survival. Modern medicine also means that beyond just surviving, many preemies thrive exceptionally well. Each day of pregnancy changes your baby. This means that while every baby born prior to 37 weeks is considered premature, a 25 weeker is far different than a 29 or 35 weeker. More than half of babies born at 23-24 weeks survive. While there’s a big jump between 23 and 24 week survival rates, some of that is based upon which babies receive intervention. Some facilities will offer medical intervention at 22 weeks, though survival rates are still low. A baby born at this gestation will weigh a bit over 500 grams (one pound). Babies at 23-24 weeks gestation typically have a breathing tube and are supported by a ventilator. Eventually, some will graduate to continuous positive airway pressure therapy (CPAP mask). A CPAP machine increases air pressure in your baby’s throat so that their airways don’t collapse when they breathe in. A nasal cannula would follow as your baby’s breathing becomes more stable and then no respiratory support before NICU discharge. 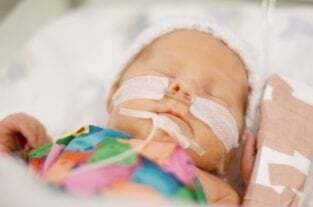 Some babies will remain on a ventilator and eventually require a tracheotomy for long-term respiratory support at home, or they may go home on oxygen with a nasal cannula. This is common for micro preemies; babies born weighing less than 800 grams (1.75 pounds) or prior to 26 weeks gestation. The type of initial and ongoing respiratory support needed is often impacted by whether or not steroids were administered prior to birth. Babies born at this gestation can’t eat by mouth yet. They will have IV lines, often umbilical lines as well, placed to provide medicine, nutrition and hydration. Depending on how your baby is doing, they will eventually begin feeds via a feeding tube placed in their nose (NG) or mouth (OG). Breast milk remains the biologically normal food for a preemie as a mother’s milk is different than had she given birth to a full-term baby. At this gestation, however, many healthcare providers fortify breast milk with extra calories and nutrition which babies typically get in the third trimester. Supporting micro preemies is a newer area of medicine and the evidence is still growing regarding the best way to help these tiny babies grow. Some babies will go home with no feeding support and be at the breast or feeding with a bottle. Others will go home with an NG tube (a feeding tube in the nose), or with a G or J tube (stomach or intestinal tubes) for long-term feeding support. It will be important to work with healthcare providers familiar with preemie development. All preemies, especially the earliest ones, benefit from long-term support with developmental paediatricians and a variety of therapists. Sometimes this is to receive services, other times it’s simply to monitor preemie babies as they’re at an increased risk for developmental delays and chronic health conditions. A baby born at 25-26 weeks gestation weighs around 680-900 grams (1.5-2 pounds) and has a survival rate of up to 80-90%. Babies born at this gestation often require a breathing tube and ventilator. Some quickly transition to a CPAP mask and then nasal cannula, others will require long-term breathing support. They’re unable to take feeds by mouth and will have IV lines placed. How long they’re dependent on IV based nutrition is unique to each baby. They’ll eventually be given nutrition via an NG or OG tube (nasal or oral). Breast milk, whether yours or donor milk, is often fortified for babies at this gestation, preferably with human milk-based fortifier. Exclusive human milk diets reduces the risk of necrotising fasciitis, a serious infection. When breast milk is unavailable, they’re given formula designed to meet a preemie’s extra caloric and nutrient needs. Exclusively pumping until baby can feed at the breast can be extremely time consuming and quite challenging, but every drop you’re able to provide is important as it’s helpful for their development and preventing infection. You can read more about exclusively pumping in BellyBelly article Exclusively Pumping Breast Milk – 7 Secrets to Success. The earlier a baby is born, the higher their risk of chronic lung disease, developmental delays and other health conditions. For this reason, as mentioned above, it’s important to work with specialists to keep an eye on their development. Babies born around 27-28 weeks need a good bit of support, though their respiratory system is more developed than at 23-26 weeker, and should expect a NICU stay close to their due date. A 27-28 weeker may or may not need support from a ventilator. They will need some respiratory support, however, whether ventilator, CPAP or nasal cannula. The length of time they need support varies greatly baby to baby. Some will quickly graduate to room air, while others will need long-term support. Feeding guidelines vary hospital to hospital. Your baby will likely have IV and umbilical lines placed for immediate nutrition, hydration and medicine as well as an OG or NG tube. Many facilities don’t start oral feedings (breast or bottle) until 32 to 34 weeks gestational age. This is because preemie babies aren’t yet able to suckle and breastfeeding can be very tiring for them, using up the little energy they gain very quickly. Skin to skin, or kangaroo care, is extremely beneficial for preemies. Depending on your baby’s level of life support, you may be able to hold them immediately, or you may have to wait a few days to a few weeks. Be sure to read Kangaroo Care For Preemies – Why it Matters and How to Do It to learn more. It can be scary to hold your baby with wires, tubes and breathing support, but your baby’s nurse can help you to get comfortable. Babies born at this gestation are around 1000 grams or 2 pounds so with a bit of help, you’ll learn to easily navigate all the wires and tubes. Many premature babies catch up in growth and development around 2-3 years of age. The earlier they’re born, the longer it can take. Of course, just as with full-term babies, every baby develops at their own unique pace. Just like preemies born at 23-36 weeks, these babies will be at an increased risk of developmental delays and chronic health conditions. It can be helpful to prepare for such circumstances while also remembering that a risk is not a guarantee. Babies born at 29-30 weeks gestation are still quite early and in need of a good bit of support. However, their respiratory system, and other systems, are a bit more developed than their earlier preemie peers. A baby born around this time is about 1 kgs or 2.5 pounds. Some babies are much smaller due to conditions such as intrauterine growth restriction, preeclampsia, which can lead to preterm births. Babies born at this gestation may or may not require a breathing tube (intubation). Some will require long-term breathing support, others are on room air within a few days or weeks. They will not be ready for oral feeds for a few weeks and will require and NG or OG tube. They will also have IV lines placed for at least the first few days, longer dependent upon their nutrition and medical needs. Preemies will have frequent blood sugar tests until their care providers are sure they can maintain their blood sugar levels. This can be for just a day or two, or for several weeks. They’ll also receive heel sticks to get a small amount of blood to check for jaundice. They may only need one to a few draws, or they may need several over the course of a couple weeks. If their bilirubin levels are high, they will receive phototherapy for jaundice. Learn more about jaundice and Bilirubin Levels – What’s Normal And What’s Not. Every baby born prior to 34 weeks, and many born prior to 36, will spend some time in the NICU. The earlier a baby is born, the longer they are likely to be in the NICU. Many doctors will say to prepare for a NICU stay until baby’s original estimated due date. Some will go home a bit before, others a bit after. Every baby is unique, however, and their length of stay will vary. A baby born at this gestation will often weight around 1.5-2 kgs (3-4.5lbs). Their NICU experience is often like what’s described for the 27-30 weekers but they may go through each stage a bit faster. Less time on breathing support, less time with a feeding tube, etc. Each week a baby remains in utero, the more developed each of their systems are. Some of these babies will even be ready to go home around 35-37 weeks. However, many will still need more time in the NICU to get their feeding skills down, outgrow apnea of prematurity, reach a certain weight, and to maintain their body temperature. Occasionally, babies are sent home with medical devices (e.g. apnea monitor, feeding tube, etc.) but in most cases, the best situation is waiting for them to outgrow the need for them. Some facilities will allow practice attempts at the breast or bottle at this gestation, but many wait until 33-34 weeks. Depending on their respiratory support, some babies will need to wait even longer as it’s unsafe to attempt oral feeds with certain devices in place. Babies at this gestation will typically have an IV and/or umbilical lines placed at birth. This allows nutrition and medication to be given quickly, as well as allow doctors to quickly check their blood gases (ensuring they’re getting enough oxygen). Some babies won’t need IVs for very long, others may need them for a couple to several weeks. The longer a baby develops in utero, the lower their risk of long-term developmental delays and medical conditions associated with prematurity. Your baby will be monitored in the NICU for signs of brain bleeds (less likely the longer they remain in utero, as well as when mothers receive magnesium before birth) which can be associated with developmental concerns. They should also be monitored after discharge until they catch up to their full-term peers (often by 2-3 years), or receive necessary support to help them develop their best at their own pace. Most facilities require every baby born under 35 weeks to at least be evaluated, if not admitted to the NICU. A 33 weeker will almost definitely require at least some time in the NICU. A 34 weeker, very occasionally, is discharged when her mother is discharged, but most need a bit of support transitioning after birth. Many 33-34 weekers can breathe room air right away, but many will also still need some respiratory support. While it’s possible they’ll need a ventilator, many need just a nasal cannula, and some a CPAP. For most 33-34 weekers, the biggest challenges are oral feeding, jaundice and maintaining body temperature. Be sure to read about Breastfeeding A Premature Baby – 7 Great Tips. These babies are more likely to be discharged prior to their original due date. However, it’s still a good idea to be prepared for a 6-7 week stay as it’s possible they’ll need more time to meet discharge requirements. Most babies at this gestation will need a bit of monitoring while in the hospital to be sure they’re transitioning and feeding well. Some babies at this gestation will need a bit of time in the NICU to learn to feed, maintain their body temperature, and occasionally require respiratory support. Some 35-36 weekers are discharged with their mother. Others will need a few days to a couple weeks in the NICU. Babies born at this gestation are more likely to have some feeding difficulties as they’re less alert than their full-term peers. They’re also more likely to need phototherapy for jaundice, and they may require some monitoring for blood sugar. A 35-36 weeker can weigh around 2.2-2.7 kgs (5-6lbs). Some are much bigger and closer to a full-term baby, others are much smaller when IUGR, preeclampisa, etc. are involved. Most babies at this gestation quickly catch up to their full-term peers and rarely need to account for adjusted age in the same way an earlier preemie would need to. Of course, every day and week in utero is extremely beneficial for development so they’re still at an increased risk of needing early intervention support (e.g. physical, speech or occupational therapy) when compared to their full-term peers. Having a preemie can be a scary journey. It’s rarely expected and it’s certainly not the desired outcome for a pregnancy. Fortunately, with modern neonatology and many early intervention specialists, preemies today not only survive, most thrive quite well!